British scientists have identified a virus which “eats” the bacteria that causes the hospital superbug Clostridium difficile (C.diff), in a breakthrough that could have major implications for the fight against antibiotic resistance. 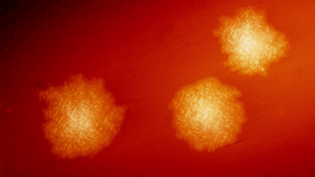 The technique represents a viable alternative to antibiotics for the treatment of bacterial infection, using naturally occurring viruses called bacteriophages – ‘eaters of bacteria’, or phages for short. Researchers at the University of Leicester have isolated phages that specifically target C.diff, an infection of the gut that killed 1,646 in the UK last year. In lab tests, funded by the Medical Research Council, the viruses were 90 per cent effective against the most dangerous strains of the bug. The danger posed by growing resistance to antibiotics is one of the gravest health risks facing the world, doctors have warned, and alternative methods for treating bacterial infections are being urgently sought. Dr Martha Clokie, who led the research at Leicester’s Department of Infection, Immunity and Inflammation, said that phages could have a major role to play in coming decades. Next:Does your healthcare laundry look like this, or this?